A history of freedom in Western culture traces the evolution of this cherished idea from ancient times to the modern day. Reprint. National Book Award winner. NYT. Seymour Papert is Lego Professor of Mathematics and Education at MIT, where he is also co-founder of the artificial intelligence and media laboratories. I use this as the basis of a Minecraft + (i)Python class I teach, and as I tell everyone who asks, I'm really more or less working straight out of this book. It's the intellectual foundation - and stands in stark contrast to instructional material that just plows through teaching variables, loops, decision logic, procedures, and so on, i.e. the vast majority of programming literature. It was wonderful to see some of the kids "get" the math side of programming when we walked through the commonality between square and triangle functions - creating a general purpose polygon function, and then refactoring square and triangle to use it. There's so much they're being taught that they don't necessarily even realize, because it's all being delivered as something that's engaging and "fun". A lot of this book involves stories about the Logo / Turtle programming system. Logo and Turtle might not be used much any more, but the ideas that that developed around them continue to be pertinent. One of Papert's central ideas is that people learn best when immersed in an environment in which they can interact with, build with, actually use the concepts they are learning, rather than learning more abstractly. For example, learning to speak French in Paris vs. learning to speak French in a United States classroom. The goal of Turtle programming was to immerse learners in an environment in which they could interact with the ideas of Newtonian mechanics and differential geometry. 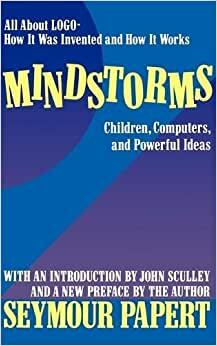 But Papert's goal with this book was to inspire educators to take this idea further, building more immersion environments in which students could learn a variety of subjects. If you read this book looking to be amazed by frontiers in educational technology, you may be disappointed. But if you can separate the ideas presented from the now-technologically-ancient environment in which they were implemented, I think you could do as Papert hoped, and apply those ideas in other contexts. Overall a very good read, which has broadened my thinking in terms of how people learn. This is the best book I have ever read on how to assist people to learn for themselves. Papert began his work by collaborating with Jean Piaget, and then applied those perspectives in a self-programming language designed to help children learn math and physics. Papert explains Piaget's work and provides case studies of how the programming language, LOGO, can help. He provides a wonderful contrasting explanation of the weaknesses of how math and physics are usually taught in schools. I learned quite a few things from this that I did not know before. People are very good at developing theories about why things work the way they do. I knew that these theories are almost always wrong. What I did not realize is that if you give the person a way to test their theory, the person will keep devising new theories until they hit on one that works. What is usually missing in education is the means to allow that testing to occur. An especially imaginative part of this book were the discussions of how to create theory testing solutions that are much simpler and easier to apply than any school problem you ever saw in these subjects. 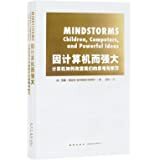 Papert works from a very fundamental and deep understanding of math and physics to reach the heart of the most useful thought processes for applying these subjects. It is thrilling to read about what you have known for many years, and to suddenly see it in a totally different and improved perspective. Another benefit I got from this book were plenty of ideas for how to help my teenage daughter with her math. She is very verbal, and Papert points out that math seldom teaches a vocabulary for talking about math. As a result, she memorizes a lot and gets dissociated from the subject. I got a lot of ideas for how to encourage her to personalize the concepts and problems by moving her own body. From that I realized that I often solve the same kinds of problems by recalling physical situations I have been in. But I have failed to help her make that connection because I was unaware of it on a conscious level. If you want to improve as a learner, help others learn better and faster, or simply want to understand more about different ways to think, this is a great book. I hope that all teachers get a chance to read and apply it.